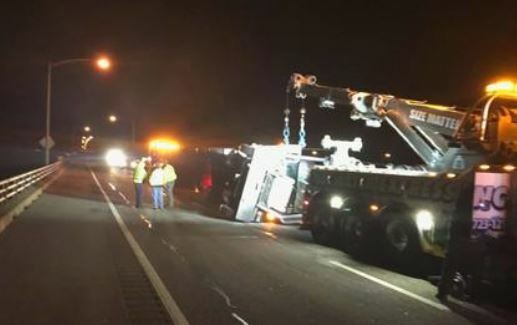 KIPTOPEKE, Va. (WAVY) — A tractor-trailer flipped on its side Friday night as high winds hit the Chesapeake-Bay Bridge Tunnel and surrounding areas. The crash happened around 7:30 p.m. when winds were in the low 30s in miles per hour, but the gusts later increased to up to 77 mph, according to Tom Anderson, the Deputy Executive Director of the Bridge Authority. Anderson says the driver was OK and no other vehicles were involved. The driver refused medical treatment. The bridge only suffered cosmetic damage to its guard rails. Level 3 wind restrictions were put in place and the bridge-tunnel eventually closed both directions due to the wind conditions. The truck crash shut down all southbound lanes for a while, and the bridge-tunnel eventually opened at normal operations around 11:20 p.m.